Ryan Reynolds revealed that his wife doesn't like the picture he took hugging HyunA! On the most recent episode of 'Entertainment Weekly', Ryan Reynolds guested on the show to promote his latest film 'Deadpool 2'. While talking about his affiliations with K-pop, the Hollywood actor mentioned that a photo had caused some jealousy to arise from his wife, Blake Lively. 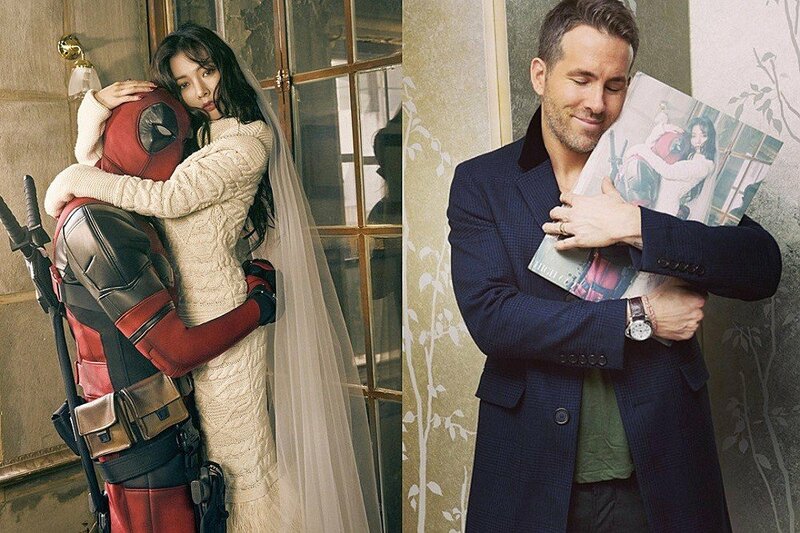 In the 'controversial' picture, Ryan Reynolds was seen hugging a photo of HyunA embracing his masked, life-size character in 'Deadpool'! The actor had taken to Instagram back in 2016, sharing this moment with the rest of the world. However, it turned out that Blake Lively wasn't too pleased with the moment herself. To the MC on 'Entertainment Weekly', Ryan Reynolds joked by saying, "My wife hates it when I go to sleep holding this photo." As reporters on the scene all laughed, the actor was later gifted with a bottle of soju from the producers. As he accepted the drink, Ryan Reynolds immediately opened the bottle and started gulping it down. Seeing the startled look on the MC's face, he said, "I'm 41." Funny how that photo keeps resurfacing, even though the two never even met in person! You can watch a part of the interview here.